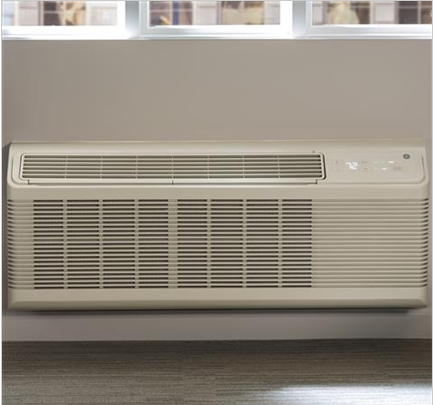 Zoneline Packaged Terminal Air Conditioners from GE Appliances have been the industry’s most trusted PTAC for decades, providing property owners with unparalleled energy efficiency and usability. Remaining true to their long-standing commitment to reliability, quietness, efficiency and appearance, GE Appliances has reintroduced the Zoneline series with brand new structural components and a fresh look worthy of any new or retro-fit application. Boasting a redesigned structure that is even more accessible to installers and technicians, the Zoneline’s construction has been duly simplified and streamlined to allow for easier and faster servicing. A rustproof base pan comes standard on all models, along with a service diagnostics port so technicians can quickly diagnose unit issues. The convenient Quick Connect detail integrates the thermostat, central desk control and external fan in seconds, further simplifying installation and maintenance. A quiet PTAC is essential to guest comfort in any hotel. Whether it be noise generated by the unit itself or outside noise brought into the room as a result of its standard through-the-wall installation, these unwanted sounds can easily prevent a guest from sleeping comfortably. Rest assured, any necessary compensations, poor reviews and lost business associated with these noise complaints can be entirely avoided with GE’s latest Zoneline technology. This series of GE Zoneline units have been deemed the quietest PTAC on the market when compared to leading competitors, an achievement made possible by their superior Sound Transmission and Outdoor/Indoor Transmission class ratings. Beginning with a baked-on sound barrier, the Zoneline surpasses other leading units in noise reduction by insulating sound with a heavy duty mastic material instead of traditional plastic. The barrier is complimented by a Weather Barrier System Seal which lines the perimeter of the unit to keep noise and dirt outside, performing optimally near high traffic areas. It’s structural components are also designed to combat noise, including dual DC fan motors and a large cross-flow blower. Having two separate motors for each fan reduces noise by dialing in the exact airflow needed for each heating and cooling function, instead of having one fan run faster and more often to manage the same output. The larger cross-flow blower operates similarly, requiring less speed (and therefore less noise) to generate the same output as its smaller counterpart. Finally, a Smart Fan cooling/heating setting allows the fan to run in either continuous mode during hot weather or cycle mode during the winter months, saving energy and improving guest comfort. GE Appliances knows that decreasing the energy usage of your properties can save you a lot of money so it’s no surprise that the Zoneline leads among the competition in efficiency. On average, Zoneline is 8% more efficient than the leading competitor for 7,000 BTUh and 9,000 BTUh electric resistance heat models, for more savings per room, per year. * Replacing an old unit with a Zoneline PTAC will cut utility bills without compromising the comfort of your guests. Optimal efficiency is attained by means of the many features integrated within the unit to specifically avoid excessive temperature swings. For example, this unit comes equipped with heat and freeze sentinels, specially designed to protect your property by preventing overheating or freezing of the unit. And thanks to electronic temperature limiting built into the unit, you can easily preset temperature limits to save energy to balance guest comfort with an efficient operation. The Zoneline has been given an updated look, with a sleek appearance that features a shallower depth for more usable room space. This model comes equipped with a back-lit, cover-less control panel, boasting large white LED lights with a dimming display. Its color has been refreshed and blends seamlessly with modern hotel/motel decors.